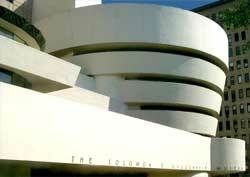 The Guggenheim Museum in New York was designed to showcase modern art. Today, its striking architecture is just as renowned as its art collection. The museum has been controversial ever since it was conceived about a half century ago. Some members of the art world have lavishly praised it while others have pooh-poohed its design and collections. You be the judge. It was designed by Frank Lloyd Wright, one of the world's great modern architects. Although his architectural tour de force was commissioned in 1943, it wasn't finished until 16 years later, in 1959, because of contentious issues with city officials, among other powerful people. Wright died just months before it finally opened. The bands of the circular exterior widen as they rise (see photo). The interior's most distinctive feature is a six-story atrium encircled by an upward spiraling ramp. That walkway's inner side has a dramatic open view of the atrium. The outer side is a wall where the paintings are hung.